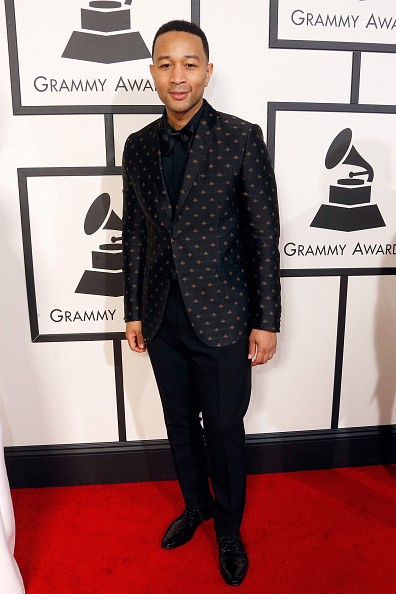 John Legend looked stunning in a Gucci suit with an all-over refined print. The black-on-black, a trend of the night and we love the black bowtie. He knows how to play with pattern. Justin Bieber stepped out in a sleek Saint Laurent tuxedo. The white jacket completed the black-on-black attire. Groomed, trimmed and looking fine, this classy look is a step in the right direction for the reformed musician. 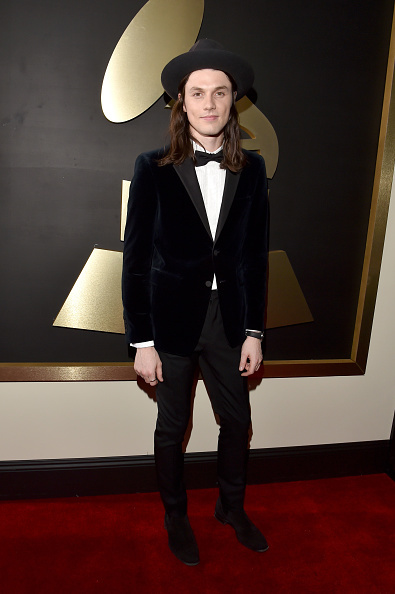 James Bay wore a slick suit by Burberry. The velvet blazer with a wide- brimmed hat really showed his personal style. The skinny pant with great suede shoes were the finishing touch. 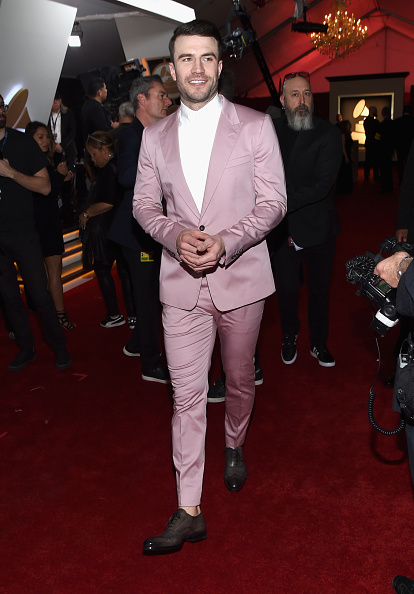 Sam Hunt donned an amazing pink Dolce & Gabbana suit that made everyone swoon. The sharp white dress shirt, buttoned up but minus a tie was simple elegance at its best. The Weekend wore a custom-made Givenchy suit, which definitely stood out on the crowded red carpet. The dapper all black look hit the mark. Sam Smith stepped out in a dapper Thom Sweeny suit. The three-piece stunner set the Englishman apart, pushing him high on our “amazing’ list. The patterned blue fabric with patterned grey tie and hot pocket square perfected the entire look. Big Sean wore a white and black suit by Z Zegna that spoke loudly to casual refinement. The unbuttoned shirt, along with the slick black lining of the pocket make this suit top on our list, with the Gucci loafers adding some additional swag. Common stepped out in what we think is a Gucci suit. Known for being a brand ambassador for Gucci, the patterned shirt next to a pattern lapel was a sharp, eye catching touch. The Bruno Magli Wesley shoes were a classic touch. Aloe Blacc wore a Laurence Airline shirt with blue, black and white pattern under a striking white Sand Copenhagen suit. The relaxed cool appearance, much like on a Caribbean vacation, had some great additions with Adidas shoes and an IWC watch to help pull the look together. Mark Ronson hit the target with a cool pinstriped navy blazer and all black attire. The skinny pant is still a staple for the red carpet. Check the shoes for that pop of white detailing, refined and on point. 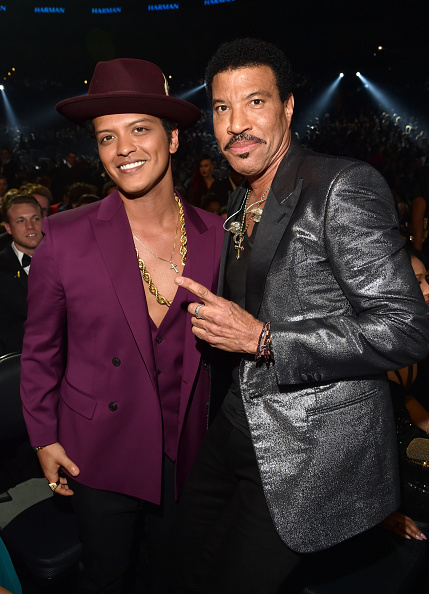 Bruno Mars went bold with a burgundy Dolce & Gabanna three-piece suit, which became a two-piece, as the shirtless musician chose gold necklace jewelry and hat to compliment the outfit. His swagger always has us watching for the latest! Stevie Wonder electrified in army green. We have to give it to him: with his signature shades, bold patterns and color choices, he is breaking traditional codes and keeping it youthful. Pharell Williams, new co-owner of G-Star, stepped out in a short platinum crop haircut (maybe a tribute to Bowie? ), matching a tweed Chanel jacket with torn jeans and popping green sneakers - a pair of his new signature Adidas that have yet to debut but seem to read "Human Race". 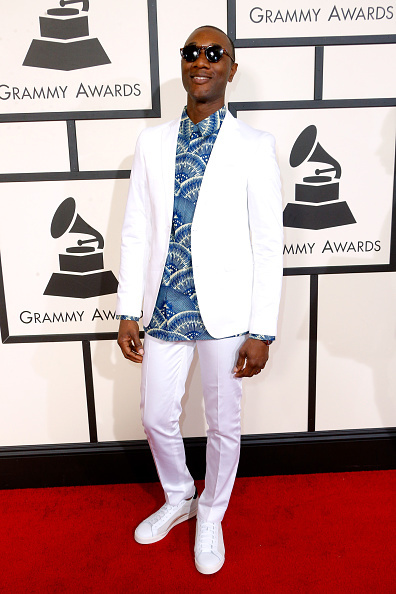 So, per usual, we are keeping a close watch on this fashion-forward musician. Demi Lavato wore a tuxedo-inspired gown with plunging neckline and suit jacket by Norisol Ferrari, with jewelry to match. The singer looked incredibly fierce on the red carpet. Zendaya stepped out in her menswear-inspired, custom-made double-breasted suit by DSquared2. The Bowie-inspired mullet haircut didn’t seem to offset this stunning look.